In Manitoba protected areas are protected by regulation from: logging, mining, hydroelectric, oil and gas development as well as other activities that could significantly and adversely affect natural habitat. A protected area may be designated under any of several laws in Manitoba. Mineral rights are withdrawn from all protected areas. Designation of a protected area does not affect the ability to exercise Treaty and Aboriginal rights. This definition is confirmed in various public policy reports, statutes, and in national reports for which the Manitoba government provides content. One of the world's last remaining areas of intact southern boreal forest is a step closer to becoming a United Nations Educational, Scientific and Cultural Organization (UNESCO) World Heritage Site. Little Grand Rapids and Pauingassi, two Manitoba First Nations, submitted land-management plans to the Provincial government June 2012. Both are among the five First Nations who initiated the World Heritage Site undertaking in 2002. The lands plans have been officially submitted to the province for approval and will be finalized following a period of public review. The public has until August 8, 2012 to submit comments on the two proposed lands plans. Polar River First Nation and Bloodvein First Nation have also submitted land management plans. Poplar River's plan was submitted September 2005 and approved June 2011, and Bloodvein plan was approved January 2012. "These plans form a critical part of the UNESCO World Heritage Site proposal to recognize this tract of southern boreal forest. They will also help ensure the long-term social, economic and environmental well-being of local residents and all Manitobans," said Manitoba Premier Greg Selinger. Five First Nations started the designation bid in 2002 and will manage the lands with the Governments of Ontario and Manitoba. The five First Nations entered into an accord in 2002, which called for establishment of the World Heritage Site. The World Heritage site was recommendation was endorsed by the World Conservation Union in 2004 and by Manitoba Government in November of 2004. Manitoba and Ontario nominated 33,400 square kilometres of boreal forest, rivers, lakes and wetlands spread across eastern Manitoba and into Ontario as a UNESCO World Heritage Site candidate January 18, 2012. The nominated area includes the already established Atikaki Provincial Park in Manitoba and Woodland Caribou Provincial Park in Ontario. The area is considered rare because it is one of the last remaining sections of southern boreal undisturbed by industrial development. Regulations required to establish Bloodvein First Nation Pimitotah Lands Management Plan and planning area were established December 10, 2011 and amended December 24, 2011. Although the entire area is 3,914 square kilometres (391, 400 hectares) only 1,326 square-kilometres (132,600 hectares) of newly protected land is created through establishment of Kichinatagon Special Management Zone, where industrial development, including logging, mining and development of oil, gas, and hydroelectric facilities is prohibited. Already established and designated, Atikaki Park and the Bloodvein Canadian Heritage River encompass 1,061 square kilometres of the total planning area. Industrial development has been prohibited in Atikaki Wilderness Park since the 1990's. The 846 square-kilometre Bloodvein Local Community Resource Zone allows community development of sustainable forestry, distribution transmission lines, all-season roads, sand and gravel quarries, and peat extraction. The 681-square-kilometre Bloodvein First Nation Commercial Development Zone will allow commercial forestry, joint resource development with the First Nation, an upgraded transmission line or new distribution lines to the community, and sand and gravel quarries associated with the construction of an all-season road corridor. Pimitotah Traditional Land Management Plan is the second First Nation lands planning area established by regulation under Manitoba's East Side Traditional Lands Planning and Special Protected Areas Act. Poplar River First Nation's Asatiwisipe Aki Management Plan was regulated June 25 2011, after changes in zones and additional lands were added to an interim protected area established in 1999. Poplar River and Bloodvein's traditional areas are part of the UNESCO World Heritage Site nomination submitted to UNESCO January 2012. 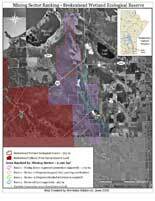 The draft Pimitotah Lands Management Plan was posted June 28, 2011 and open for comments until August 23rd, 2012. Although comments were solicited and the plan apparently updated from the draft version filed in June 2011, Manitoba Wildlands was unable to find a record of any comments received or which changes made to the draft lands plan. "This lack of access to information shows we need a real public registry under the East Side Traditional Lands Planning and Special Protected Act," said Manitoba Wildlands director Gaile Whelan Enns. Six Manitoba park reserves have been given another five-year renewal until December 14, 2016. These six Park Reserves (Goose Island, Grand Island, Pemmican Island, Pelican Island, Sturgeon Island, and Kinow Bay) were initially established under Manitoba's Parks Act June 1, 2001. This is the third time these six park reserves have had reserve status extended for an additional five-years. Typically park reserves provide interim protection while the decision for permanent park designation and protection is made. Almost 12 years after interim protection was first announced the Fisher Bay Park received permanent protection July 4th, 2011. Fisher Bay Provincial Park is 200 kilometres north of Winnipeg and 84,150 hectares of water, islands and west shoreline of Lake Winnipeg. Only one-quarter, 23,150 hectares, of the Park is protected. Waters regulated for Manitoba Hydro are not protected. The area first received interim protection until 2005 in May 2000, but interim protection was extended for another five years November 2005, and another five years November 2010. The interim protection could have lasted until October 31, 2015. The Fisher River Cree Nation, whose traditional lands include the protected area, have been lobbying for years for the area to be formally designated a protected provincial park. "The Fisher Bay Provincial Park is a momentous step toward protecting the environment, sustaining culture and tourism opportunities for local communities in the area," said Chief David Crate of Fisher River Cree Nation. According to Conservation Minister Bill Blaikie, aboriginal and treaty rights will be respected and maintained in the park. The lands in the park will remain as is and current hunting, fishing, trapping and gathering activities of local aboriginal people will continue. Commercial fishing and trapping activities will not be affected by the park designation. The announcement was made in the final few day before a mandated government announcement black-out before the Manitoba October 4th, 2011 General Election. 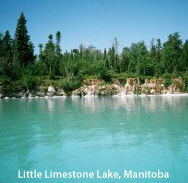 Manitoba announced permanent establishment of the 4,810 hectare Little Limestone Lake Provincial Park June 24, 2011. 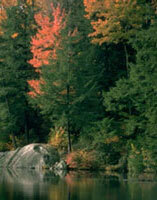 The newly designated provincial park was first designated and protected as a park reserve July 2007. Crown mineral rights were withdrawn at that time also. The park includes Little Limestone Lake, islands in the lake, and a 100-metre wide strip along the south, west, and northern shorelines. Park reserves can provide interim protection while the designation is considered for permanent protection and provincial park status. Little Limestone Lake is the worlds largest marl lake, located near the northwest corner of Lake Winnipeg, 450 kilometres north of Winnipeg, and 65 kilometres north of the community of Grand Rapids, adjacent to Mosakahiken Cree Nation Reserve. Marl lakes turn from clear to an opaque turquoise or even a milky blue-white in warm summer weather, when calcite increases. Manitoba Conservation solicited public input on Little Limestone Park Reserve between July 15 and August 31 2010. Manitoba Wildlands submitted comments highlighting: the inadequacy of a 100 m buffer zone around the lake, lack of classification in Manitoba's Parks Act for water, and inadequate or non-existent consultation and public review standards. Manitoba moved about 800,000 hectares of boreal forest and wetlands on the east side of Lake Winnipeg to permanent protection June 16, 2011. The protected traditional area first received protection under two Manitoba Acts in 1999, and is based on the lands plan submitted by Poplar River First Nation (PRFN) in 2005. The lands are located about 400 kilometres north east of Winnipeg. PRFN nominated the area, interim protection was first established in 1999, and was extended several times. The is the first time lands have been 'protected' by regulation under Manitoba's East Side Traditional Lands Planning and Special Protected Areas Act. Poplar River's protected traditional area to be part of the UNESCO World Heritage Site bid that goes to Canada for review in 2011, to be formally submitted in 2012. Five Ontario and Manitoba First Nations first entered into an accord for the future of their neighbouring lands in 2002. The accord indicates that world heritage site listing would be investigated by the communities. "The community resource use area, and the new road corridor are not protected lands, including because of dispositions issued for sand and gravel. Unfortunately the new East Side Road Authority road corridor will travel very close to the heart of these otherwise undisturbed boreal lands, and sacred areas. We hope restoration of the former winter road corridor occurs. Lands between the two corridors could also be at risk otherwise," stated Gaile Whelan Enns of Manitoba Wildlands. Kaskatamagan WMA (Wildlife Management Area) and Kaskatamagan Sipi WMA are the newest protected areas added to Manitoba's network of protected areas. Designated by Minister of Conservation, Bill Blaikie October 9, 2009, protection of 259,530 ha and 133,820 ha of land (respectively) was completed January 21, 2010. Kaskatamagan WMA completes representation of land in region 2b of Manitoba, the Coastal Hudson Bay Lowlands. Completion of a protected areas network for a region indicates that protected land in the region now adequately captured/represent the region's enduring features. Kaskatamagan WMA is the Cape Tatnum WMA, now expanded and renamed. It is a transition zone from Taiga boreal to Arctic tundra and important habitat for populations of polar bears and coastal caribou. The mouth of the Kaskatamagan River is recognized as a globally significant Important Bird Area. Kaskatamagan Sipi WMA is the only protected area in region 3, Hudson Bay Lowlands. Kaskatamagan Sipi WMA expands over 133, 829 ha of peat-covered till deposits with relic marine beaches. This region is part of the transition ecozone from Taiga boreal to Arctic tundra and is important wintering habitat for coastal caribou and represents part of the northern range of the northern leopard frog. Both Kaskatamagan and Kaskatamagan Sipi WMAs are protected from logging, hydro development, mining and oil and gas exploration and development. Both are still protectedfor traditional use, and from activities that do not significantly or adversely affect habitat. The Manitoba Government further extended the interim protection of Chitek Lake Park Reserve and Poplar/Nanowin Rivers Park Reserve as of September 28, 2009. First nominated for protection by First Nation communities in 1999, neither park reserve has received permanent protection. 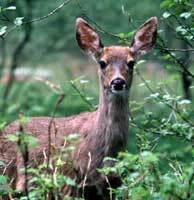 Both Park reserves were also extended in 1999 and 2004 for five year periods. The 2009 renewal lasts until September 2014. Observation Point is one of three new Wildlife Management Areas (WMA) announced by the Minister of Conservation Bill Blaikie, March 31, 2009. Observation Point WMA includes 6,530 ha of boreal forest, precambrian bedrock and wetlands in Manitoba's Lac Seul Uplands. As a provincial WMA, 6010 ha of the 6,530 ha designated are now protected from logging, mining, hydro, oil and gas exploration and development as well as any other activities that could adversely affect habitat. Observation Point WMA is characterized by its extensive wetlands covering more than 2,500 ha that are remnants of the glacial Lake Agassiz. 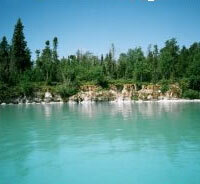 This WMA hugs the shores of Lake Winnipeg, south of the community of Manigotagan and extends south to the Sandy River. Southern borders are dominated by trembling aspen and balsam fir along the Sandy River and wetland bogs and fens are characterized by black spruce. This WMA is home to woodland caribou, moose, black bear and wolves and Great Grey Owls and is important traditional lands for the communities of Hollow Water, Manigotagan, Aghaming and Seymoureville. Whitemouth Bog WMA and Whitemouth Bog Ecological Reserve were added to Manitoba's Protected Areas Network March 31, 2009. Whitemouth Bog Ecological Reserve is 5020 ha of permanent protection, the third largest Ecological Reserve in the province. In an area of the province dominated by private lands, Whitemouth Bog Ecological reserve protects peatland bog in region 5c, Lake of the Woods. The area is characterized by bogs and fens of black spruce and tamarack and also contains the rarest type of wetland to be found in North America, the calcareous fen characterized by water tables rich in calcium and magnesium bicarbonate, resulting in less acidic water. Whitemouth Bog Ecological Reserve is home to many rare plants and species at risk including the slender leaved sundew, star-nosed moles, yellow rails, and bitterns. It is also one of the largest areas of protected habitat for the provincial bird the Great Grey Owl. Whitemouth Bog WMA borders the Whitemouth Bog Ecological Reserve adding an additional 3010 ha of protected land. Whitemouth Bog WMA is characterized by peat bogs and wetlands, remnant beaches and sand bars from glacial Lake Agassiz. 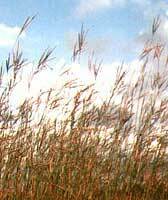 It also contains the rare calcareous fens found in Whitemouth Bog Ecological Reserve. 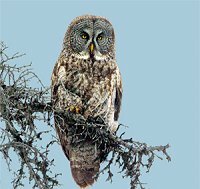 The WMA is home to rare and threatened species of plants and animals found in the Ecological reserve and also provides habitat for the Great Grey Owl. Gary Doer made an announcement about the boreal world heritage site (WHS) for the east side of Manitoba before public knowledge that he is now Canada's Ambassador to the US. First Nations in both Manitoba and Ontario, with the governments of Ontario, Manitoba and Canada, are working toward establishment of a 4 million hectare boreal world heritage site. The idea was contained in the 2002 Accord among the First Nations. The site is also on Canada's official short list of future WHS. The list was released in 2004 and applies for 10 years from that date. Manitoba government support was announced November 2004. In his speech to the August national NDP convention in Halifax, Nova Scotia Mr. Doer said: "It will take us another 10 years to get that site set up as a World Heritage Site. It will take longer but it will be more sustainable for the people living in that area and more sustainable for our planet." Gaile Whelan Enns, director of Manitoba Wildlands, commented: "I don't think any of the communities, government staff, or other partners in the WHS are aware of this decision, this delay. We assume the Manitoba government's moratorium on any developments that would affect lands to be included in the WHS will also be extended. This must mean funding to assist the communities with technical work for the WHS will also continue for the new ten year period." Requests from First Nations involved in the WHS for protection from development of traditional lands remain outstanding, some from ten years ago. 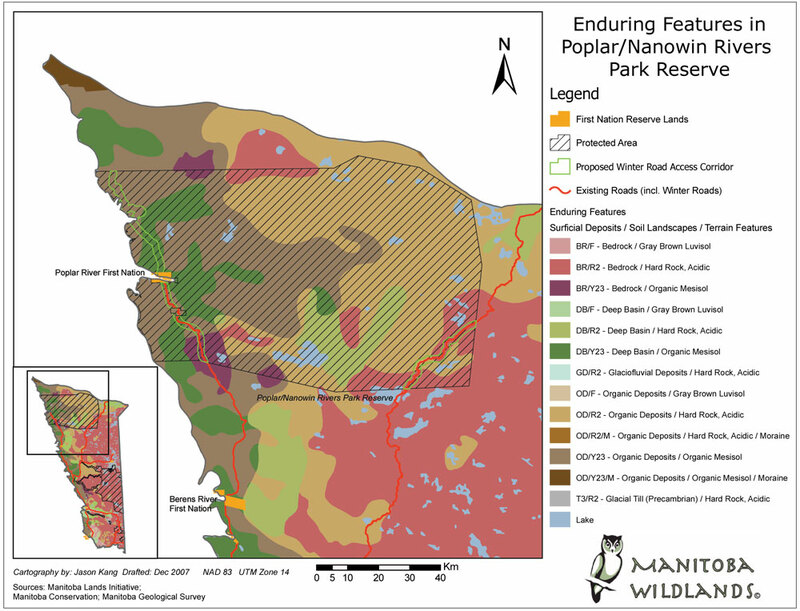 With existing interim protection for the Poplar/Nanowin Rivers Park Reserve set to expire September 30, 2009, Manitoba Conservation has initiated a process to further extend interim protection for the area in order to "allow more time for decisions to be made on its final designation". The length of this additional interim protection period is not made clear in Manitoba Government consultation materials. Poplar River First Nation publicly released its Lands Management Plan in May 2006 and permanent protection of the park reserve was an election promise of the current government during the spring 2007 election (PDF). The governments of Ontario and Manitoba announced establishment of an interprovincial wilderness area on July 30, 2008. The region covers 9,400 square kilometres of land, plus existing parks and protected areas including Woodland Caribou Provincial Park and the Eagle-Snowshoe Conservation Reserve in Ontario, and Atikaki Wilderness Park and parts of Nopiming Provincial Park in Manitoba. 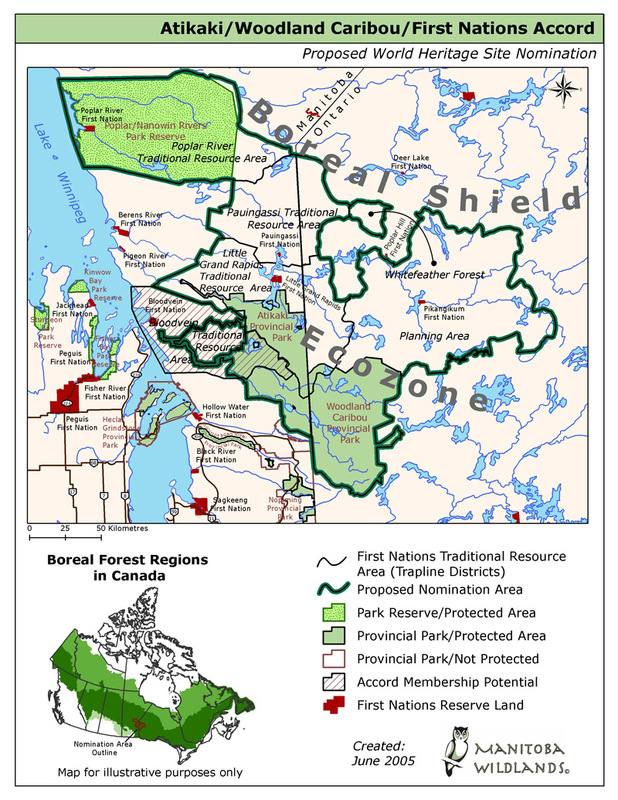 Establishing and jointly managing the area is a step by government toward inscription of Eastside Manitoba and Ontario boreal forestlands as a UNESCO World Heritage Site. The announcement was criticized as being a bureaucratic arrangement that does not increase amount of protected land, and does little to prevent mining and logging or to protect woodland caribou. None of the region''s First Nations were party to the announcement. "There's no new protected areas," said Janet Sumner, executive director of the Wildlands League. "They're basically saying, We have existing wilderness areas and we're going to talk to each other as we manage them." Eric Reder of the Wilderness Committee said if Manitoba was serious about protecting woodland caribou, it would have included new land under a new wilderness area, including where caribou calve in the northeast corner of Nopiming park. "That area remains at risk to logging despite a 1992 report stating it should be set aside from any development," he said. The amount of protected land within the Poplar/Nanowin Rivers Park Reserve has decreased by close to 20,000 ha as a result of changes to park reserve land use categories (LUC) to accommodate new, widened winter road corridors and recognize existing winter roads. The changes were made with the support of Poplar River First Nation and one change is intended to provide an alternative route for winter road access in event the primary route, heading south from the community is not serviceable. The new northern winter road route goes to Norway House. A new land use category (LUC) was used to accommodate the Winter Road Access LUC. Regulation language includes prohibitions on development, including hydro development, logging and mining. But the Winter Road Access LUC permits construction and operation of a winter road, which means significant alteration of habitat. The three winter road access corridors within Poplar River's Park Reserve are 2 km wide, which is far wider than other access corridors in existing parks and protected areas. According to the Parks Branch, the access corridor is wider to "allow for selection of the optimum 9-12 m wide route within it depending on engineering, physical, vegetation and landscape aspects." Two of the 2 km wide corridor sections already have selected routes in them. It is not clear whether the corridor will be narrowed once the road has been built, nor was information provided as to why route selection was not undertaken first. There was no winter road construction during winter 08-09. This change in corridors affects three enduring features unique to the natural region, which are not protected elsewhere in the region. The corridor changes result in the loss of protected status of portions of enduring features BR/Y23, DB/Y23 and OD/Y23. Assessment of representation for the whole region may decrease as a result. Conservation Minister Stan Struthers announced Little Limestone Lake Park Reserve designation has been renewed for a five-year period. Little Limestone Lake Park Reserve was created on July 19, 2007 and renewed January 19, 2008. This was Manitoba's first new Park Reserve established in over four years - since creation of Criddle Vane Homestead Park Reserve March 2003. Located 450 kilometres north of Winnipeg, the 4,095 hectare park reserve includes the 15-km long lake and its islands as well as a 100-metre-wide strip of shoreline, with one exception. The eastern shore is located within the federal reserve lands of Mosakahiken Cree Nation. The First Nation will play a role in managing and protecting the lake. "Our First Nations people were the first stewards of nature's land and consider conservation and protection of this extraordinary site to be a priority," said Chief Phillip Buck of the Mosakahiken Cree Nation. "The park reserve designation will allow us to enter into discussions with the province on co-management of this area." 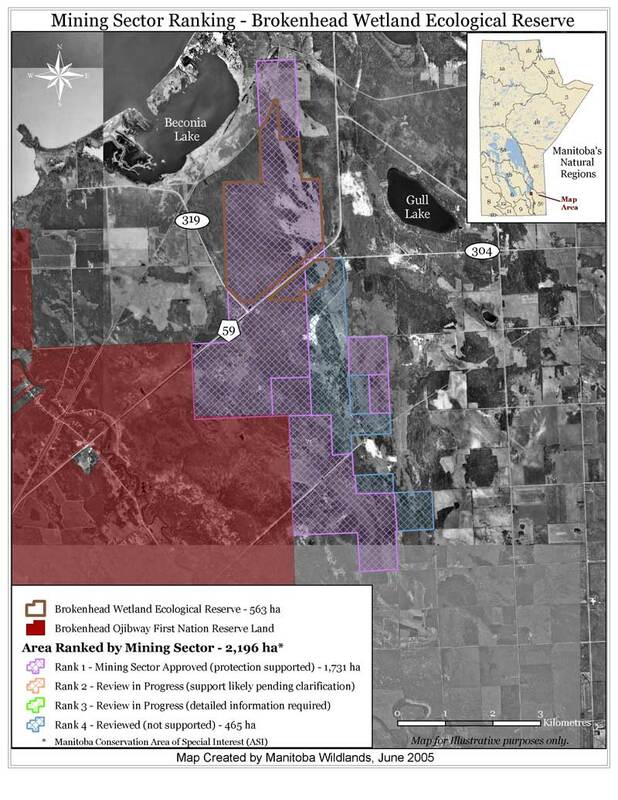 In addition to Mosakahiken Cree Nation, Xstrata Nickel was cooperatively involved with interim protection of Little Limestone Lake Park Reserve, as it overlies the Thompson Nickel Belt, an area of high mineral potential. Xstrata Nickel agreed to remove its mining claims under and adjacent to the lake to allow it to be legally protected. Jamie Robertson, director of Raglan nickel mine exploration in northern Quebec for Xstrata Nickel explained, "This is definitely a win-win opportunity for people who live here, the province and the mining industry as we work together to protect this spectacular lake and the high mineral potential of the area." Little Limestone Lake is a marl lake - a lake that changes colour as its water temperature rises and calcite dissolved in the water begins to settle out. In warm summer weather, the lake turns from clear to an opaque turquoise or even to a milky blue-white. It is considered the finest and largest example of a marl lake in the world. Little Limestone Lake is also situated amid unique "karst" (limestone) geology in the Manitoba Lowlands region and is Manitoba's second park reserve to protect unique features of the limestone landscape. Karst is pockmarked with sinkholes, disappearing streams, underground springs and lakes and underlain by caves shaped by the dissolving action of water on the limestone bedrock. As of November 1, 2007, Crown Mineral Rights to the area encompassed by Little Limestone Lake Park Reserve have been withdrawn by regulation under the Mines and Minerals Act. The renewal of the Parks Act regulation provides interim protection for 5 years. Although announced as expansion of Manitoba's parks, protected land has both been both lost and added by September 2007 Manitoba Conservation decisions. Whitemouth Falls Provincial Park is expanded from its current size of 173 hectares to over 480 hectares, with 355 hectares being protected in a backcountry zone. The 10-year interim protection for East Paint Lake Park Reserve was removed, for a loss of 13,985 hectares of protected land from Manitoba's Protected Areas Network. These lands have been added to Paint Lake Provincial Park, classified as Recreational Development and are no longer protected from industrial activity such as mining. Whitemouth Falls Provincial Park is located north of the community of Seven Sisters Falls, about 90 km northeast of Winnipeg. Whitemouth Falls, where the Whitemouth River cascades over Precambrian Shield bedrock to enter the Winnipeg River, is the major feature of this park, designated 1974. The Park now provides the first protected habitat for the Manitoba's official bird, the Great Grey Owl. In 1997 the park was expanded from 72 ha to about 173 ha, with no protection from development. This recent expansion is based on a land exchange between Manitoba Hydro and the rural municipality of Whitemouth, resulting in the RM having potential to expand the townsite. The Park boundaries shifted to include and protect ecologically significant areas of the Whitemouth Bog. East Paint Lake Park Reserve was originally part of Paint Lake Provincial Park (established1971). In 1997 it was established under the new Provincial Parks Act as a separate designation with protected status in order to provide the public and industry an opportunity to review possible uses. An extensive mineral potential study determined the area contains the same types of rocks found in the Thompson Nickel Belt. This influenced the decision to remove protected status for the East Paint Lake lands. As of this posting regulations are not in place for Whitemouth Falls under the Mines Act. This means steps to protect these lands are not all in place. Paint Lake Park changes simply put lands that were in the Park prior to 1997 back into an unprotected recreational development park. Conservation Minister Stan Struthers made an announcement August 31, 2007 concerning expansion of protected land in Beaudry Park and Nopiming Provincial Park. The Beaudry expansion announcement may make permanent a lease-agreement for 15 hectares of land between the Province and Mr. Marcel Taillieu first announced in November 2004. The Taillieu leased property is along the north Assiniboine River bank and includes undeveloped and relatively undisturbed river-bottom forest. Nopiming Provincial Park, north of the Whiteshell, will have 186 hectares of existing parkland reclassified as backcountry. The land was formerly under 'Resource Management' land use - which allows for industrial activities and is therefore not protected. These lands had been under discussion for a decade, including for an addition to protected lands twice the size of what was announced by the Minister. The Province of Manitoba and City of Winnipeg signed a memorandum of understanding (MOU) June 14, 2007 that commits the parties to protect important waterways and natural areas within the City of Winnipeg, through the provincial Protected Areas Initiative. Winnipeg would be the first community in Manitoba with areas receiving the protected areas designation. "Winnipeg has historically significant waterways such as the Red River, forests and land base rich with wildlife and biodiversity," said Struthers. "Today's agreement represents a historic first step for the city toward expanding protection and conservation efforts for these natural treasures." Manitoba Wildlands will include future protected areas in Winnipeg, based on existing public policy and regulatory tools, in its annual protected areas audit. Conservation Minister Stan Struthers announced the addition of two new Wildlife Management Areas (WMAs) to Manitoba's Network of Protected Areas, as well as the expansion of a third WMA June 21, 2006. 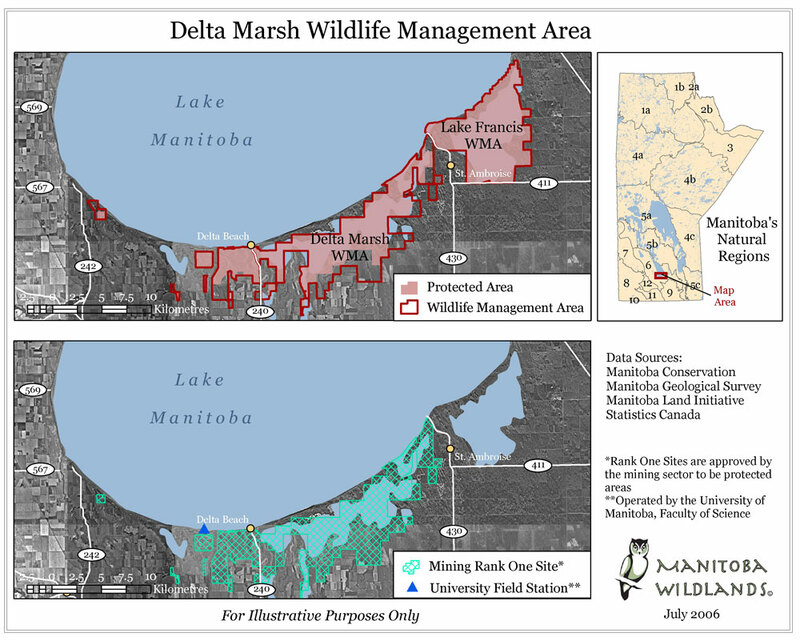 Delta Marsh is a 10,939ha freshwater coastal wetland located at the south end of Lake Manitoba. It has already been recognized as an intergovernmental Ramsar Convention on Wetlands site of international significance, a Canadian important bird area and a Manitoba heritage marsh. 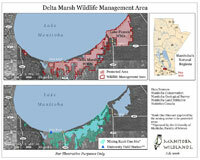 As a provincial WMA, part of Delta Marsh will now be protected from development and become part of Manitoba's Network of Protected Areas - logging, mining, hydroelectric, oil and gas development as well as other activities that could significantly and adversely affect habitat will now be prohibited within the 7,841 protected portion. Delta Marsh was formed between 2,500 and 4,500 years ago when the Assiniboine River flowed into Lake Manitoba. It is composed of a network of interconnected shallow bays separated from Lake Manitoba by a wooded barrier beach. Large numbers of colonial nesting birds can be seen around the marsh including Franklin's gulls, Forster's terns, western grebes, eared grebes, black-crowned night herons and pied-billed grebes as well as a great variety of waterfowl, warblers, white-tailed deer and furbearers. Delta Marsh is also a critical site for migrating songbirds. In addition to Delta Marsh, Minister Struthers announced the designation of the 130-hectare Hilltop Wildlife Management Area near Erickson, and the addition of a 256-hectare parcel of land to the Onanole Wildlife Management Area south of Riding Mountain National Park in the RM of Park South. As of July 17, 2006 regulations confirming protected status for these sites are not posted publicly. 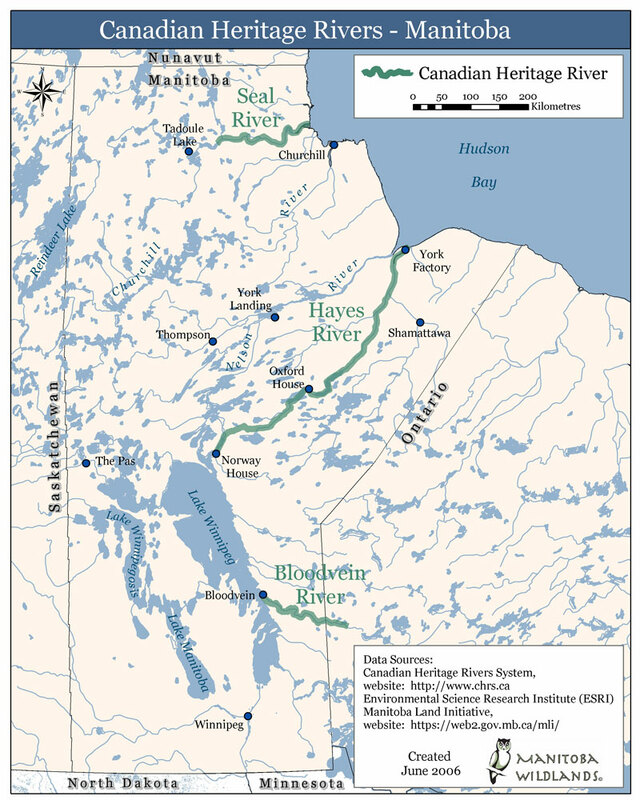 The Hayes River in Manitoba is now a member of the Canadian Heritage Rivers System (CHRS). The announcement was made June 11, 2006 by Ministerial representatives from both the federal and provincial levels. A CHRS plaque commemorating the Hayes River's addition to the CHRS was part of a ceremony to mark Canadian Rivers Day. 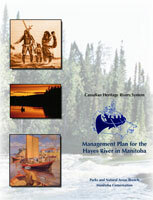 At the ceremony, Manitoba Conservation Minister Stan Struthers also released the management plan for the Hayes River. The plan, required to achieve Canadian Heritage River status, presents an integrated resource management program that will deal with water quality, public awareness, natural and cultural heritage, and recreational use. The goal of the Hayes River Management Plan is to "complement and apply existing processes for cooperation and integrated resource management that will recognize, promote and sustain the natural heritage, cultural heritage and recreational values for which the Hayes River was nominated to the Canadian Heritage Rivers System." Although the designation of the Hayes is an important and welcomed step, it does not protect the waterway or its associated riparian areas from industrial development such as in the case of a national park or provincial protected area. There are no regulations under federal or provincial legislation to formally designate and protect Canadian Heritage Rivers. Areas of Interest for future protected areas along the Hayes River are not included in the decisions, and continue to be stalled in the province's Action Plan for a Network of Protected Areas. Combining the Heritage River decision with new protected areas would dramatically increase future tourism potential, and security of habitat for boreal species. The Hayes is the longest naturally flowing river in Manitoba. The CHRS designation is for the entire 600 kilometre fur-trading route used by the Hudson Bay Company between Norway House National Historic Site of Canada near the top of Lake Winnipeg and York Factory National Historic Site on Hudson Bay. It encompasses a portion of the east channel of the Nelson River, the Echimamish and Hayes Rivers. It cuts through a pristine landscape of granite outcrops and boreal forest in the south, traversing the Precambrian Shield, before it makes its way through ancient marine sediments and taiga forest in the north to reach Hudson Bay. The Hayes River traverses the traditional territory of four First Nations - Norway House Cree Nation, Bunibonibee Cree Nation, Shamattawa First Nation and York Factory Cree Nation. For these First Nations the historic Hayes River fur trade route is part of their history, as well as a current route along which people continue to practice traditional activities such as hunting, fishing and trapping. Birch Island and surrounding waters with some outlying small islands has been moved by Conservation Manitoba from interim protection, in place since May 2000, to permanent protection and designation as a Backcountry park. Regulatory steps were taken in late 2010, with an announcement Thursday March 3 2011. It is assumed that permanent designation is based on prior, informed consent by Pine Creek First Nation, who originally nominated these lands and waters for protected status, and any other affected communities. According to the Manitoba government press release: "This newly protected area was highlighted in the 2010 throne speech and is Manitoba's 84th provincial park." Birch Island has been protected since 2000, with regulations under the Manitoba Parks Act, and Mining Act. Manitoba has 84 provincial parks if the tally includes all the road side sites, and recreational sites. The tally for protected parks, where all or part of the park is protected comes to 22. "The designation will legally protect the park area from commercial logging, mining, hydroelectric development, oil and gas development, and any other activity that may significantly or adversely affect habitat," according to the news release. This confirmation of protection standards for Manitoba's protected areas system is clearly stated. Manitoba Conservation has made Birch Island a permanent protected area under the Parks Act. Birch Island Park Reserve, located in natural region 5a & b in Lake Winnipegosis was protected in 2000 based on a First Nation community nomination. The interim regulation to protect the island, surrounding waters, plus several small islands, reefs, and shoals for nesting birds, was among the first set of protected areas announcements made by Manitoba's NDP government. In September 2010 Conservation Minister Blaikie said, "We want to protect the Birch Island area for future generations to enjoy as great example of Manitoba's varied landscapes." Public comments were requested and regulations signed in November 2010. 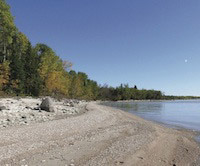 The Birch Island park reserve connects to Chitek Lake Park Reserve, which was also First Nation nominated, though only one third of the lands nominated and approved for protection by Manitoba's mining sector, was protected. Conservation Minister Stan Struthers announced November 1, 2005 that Fisher Bay and Birch Island - two northern Interlake park reserves - will continue to be protected for another five years. Fisher Bay Park Reserve is 89,000-hectares, located near three First Nations communities on the western shore of Lake Winnipeg. Over 20,000 hectares of shoreline and wooded islands on Fisher Bay at the mouth of the Fisher River are included in protected lands within this park reserve. Birch Island Park Reserve is a 79,000 hectare area located about 150 kilometres north of Dauphin. The protected park reserve includes Birch Island and several smaller islands in Lake Winnipegosis. 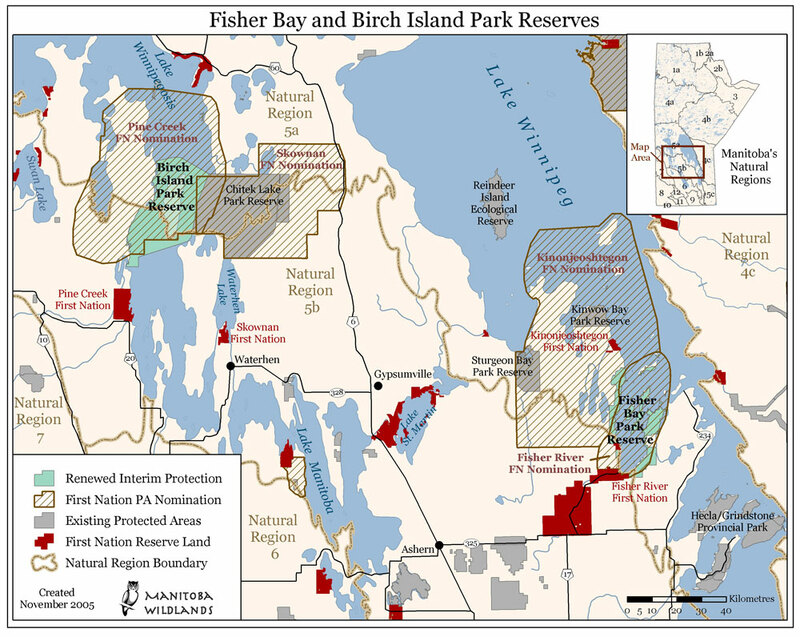 The Fisher Bay and Birch Island Park Reserves together constitute about 168,000 hectares and were initially established in May 2000. Both were nominated by First Nation Communities. Currently, 13 park reserves - areas nominated by First Nations and designated under the Parks Act - are protected from development (logging, mining and hydroelectric development). Conservation Minister Stan Struthers announced the addition of two ecological reserves - Armit Meadows and Birch River - to Manitoba's protected areas network September 21, 2005. 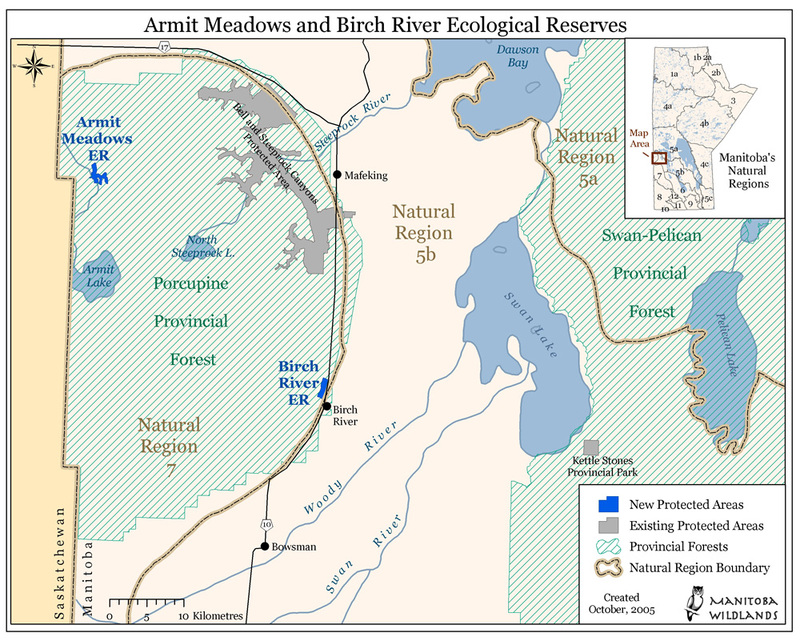 Armit Meadows Ecological Reserve covers 263 hectares within the Porcupine Provincial Forest, located in the northern portion of Manitoba's Western Upland Natural Region near the Manitoba/Saskatchewan border. The landscape is dominated by Spruce forest, however it also includes several small meadows that support grassland or wetland communities. Some of the grassland meadows (totaling approximately seven hectares in size) are endangered fescue prairie and are the most northerly-known examples in Manitoba. Only 5% of the original fescue prairie ecosystem remains on the Canadian prairies today. Birch River Ecological Reserve is a 183-hectare site found located two kilometres north of the community of Birch River, and also within Porcupine Provincial Forest. Originally, the area being considered for protected status (the Area of Special Interest or ASI) was almost double the size of the final ecological reserve. The Birch River ER reflects a complex geological and glacial history through rugged topography, which also allows it to support several diverse plant communities. It includes parts of three beach lines formed by former Glacial Lake Agassiz. Inter-beach depressions are host to wetland communities, including bog lakes, intermittent lakes, sedge meadows, willow flats, floating bogs, treed muskeg, sparse mixed wood forest and open tamarack/black spruce forest. The area is home to 17 orchid species, which represent over 40% of Manitoba's orchid flora. 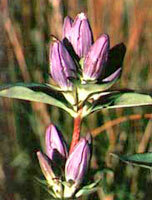 Several other plants that are considered rare in Manitoba are also found here. 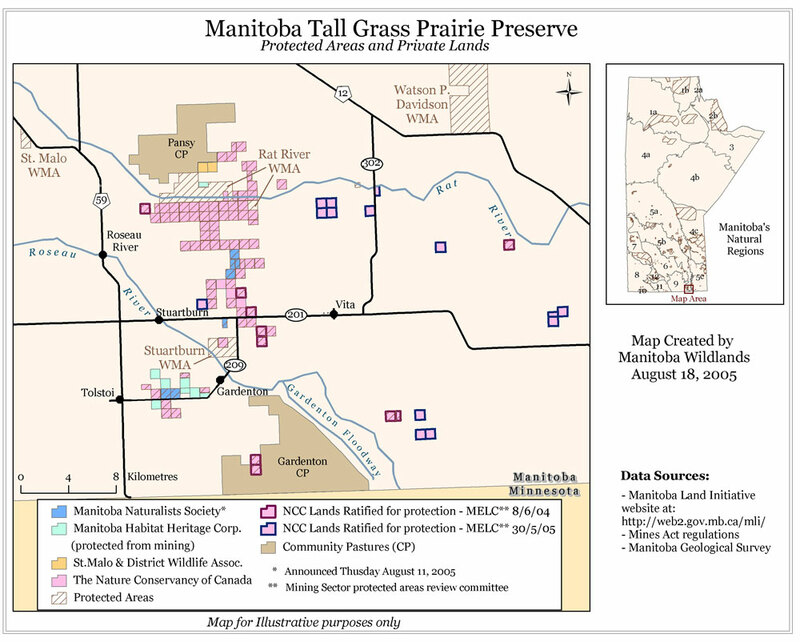 Tall grass prairie sites owned by the Manitoba Naturalists Society (MNS) within Manitoba's Tall Grass Prairie Preserve have been formally recognized by the Government of Manitoba during summer 2005. Through a Memorandum of Agreement with the Government of Manitoba, 355 hectares of MNS-owned land has been added to Manitoba's network of protected areas. The Agreement, ensures that MNS lands meet Manitoba's definition of a protected area (prohibition of logging, mining, hydroelectric, oil and gas development, as well as other activities that could significantly and adversely affect natural habitat). The MNS lands are referenced as 'Protected Private Lands'. The lands are located within the Tall Grass Prairie Preserve, south of Winnipeg near PTH 59 in the Rural Municipality of Stuartburn. Extensive Nature Conservancy lands in the Preserve were subject to a similar MOU in 2004. The Manitoba Habitat Heritage Corporation also holds title to sites in the Preserve; mostly lands purchased by World Wildlife Funds Canada. 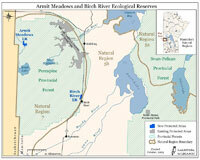 Crown mineral rights to most of the Preserve were withdrawn in 1997. These tall grass prairie lands have been included in the annual Manitoba Protected Areas Grade since that time. Nature Conservancy (NC) lands acquired since then had their crown mineral rights withdrawn in 2004. Further NC lands are awaiting crown mineral rights withdrawal so they can be 'private protected areas'. These conservation organizations have been jointly assembling the Preserve for 20 years. The tall grass prairie was a vast fertile grassland that once dominated the Southern Manitoba landscape, but has since been reduced to less than 1% of its original expanse and is the most rare ecosystem in Canada. The diverse prairie boasts more than 300 plant species and a variety of animals including butterflies, frogs, songbirds, deer, elk, moose, bears and some wolves. It is also home to a number of threatened and endangered species. The new Brokenhead Wetland Ecological Reserve (ER) is Manitoba's 19th ecological reserve and newest protected area. Announced by Premier Doer on June 24, 2005, the 563-hectare parcel of land is located along PTH 59, north of Winnipeg and northeast of the Brokenhead Ojibway Nation reserve. This type of wetland is rare in North America and contains a marshy area of land called a calcareous fen and a rare white cedar forest community. The calcareous fen is similar to a bog but is less acidic and features a fluctuating water table. Groundwater and surface water movement is a common characteristic of fens and can be seen in the channels and pools in the Brokenhead wetland. The Brokenhead wetland also features 23 species of provincially rare and uncommon plants and is home to 28 of Manitoba's 36 native orchid species, including the rare ram's head lady's-slipper (Cypripedium arietinum), and eight species of carnivorous plants. The Brokenhead Wetland was designated after considerable support from the Mining Sector, Brokenhead First Nation, environmental organizations and Native Orchid Conservation Inc. Most of the lands within the current boundaries for the Brokenhead Wetland are approved lands for protected status by the Mining Sector. 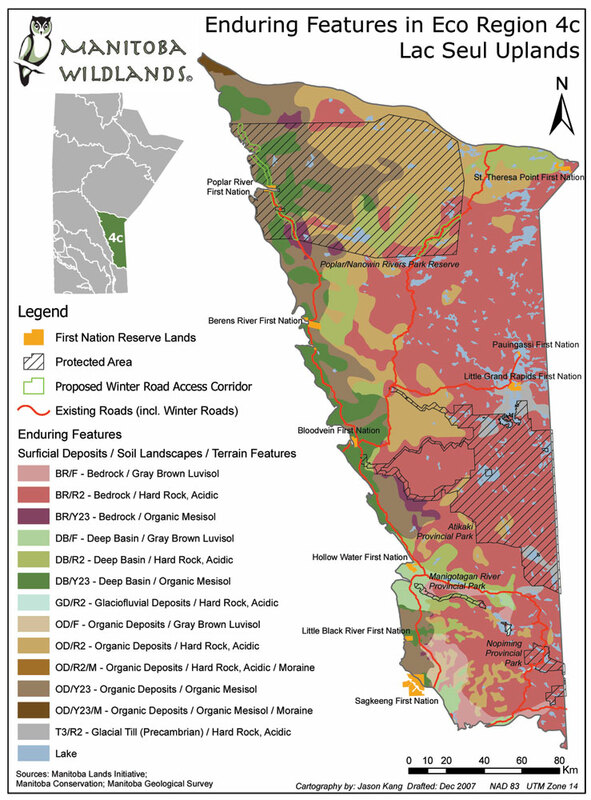 The final designation however, includes only about one third of the lands supported by the Mining Sector (please refer to Manitoba Wildlands' map showing the ER and Mining Ranked lands right). On December 3, 2004, the Manitoba Government formally announced that Manigotagan Park Reserve would be permanently protected from development as a Natural Park. Manigotagan Provincial Park was designated by regulation 215/2004 on December 1, 2004. The majority of park lands (roughly 99%) are backcountry land use, however a portion of the park was designated as recreational development to allow for existing mining claims, and is therefore not strictly protected. Manigotagan Park Reserve was first established in 1997. It has been the subject of intense public education and campaigning by the Manitoba's Western Canada Wilderness Committee to expand the initial 250 metre corridor designated on either side of the river. In response, the Manitoba government expanded and protected the corridor to 750 metres on either side. Situated near the mouth of the Manigotagan River about 115 kilometres north of Pine Falls, the park is adjacent to the northwest tip of the Nopiming Provincial Park in the Precambrian Boreal Forest of Natural Region 4c. The 7,432 hectare protected area is home to a 750-metre corridor on either side of the river and is home to majestic wildlife including moose, black bears, wolf, caribou and eagles. It is also home to spectacular plant life including prickly pear cactus, Canada yew (the only yew found in Manitoba), elderberry and green ash. The park will be managed in a manner that recognizes and respects treaty rights and the goals and values of the regional communities. Both the Town of Manigotagan and Hollow Water First Nation gave their consent for protection of Manigotagan River corridor. The final step to protect Manigotogan River Park was taken in October, 2005 when crown mineral rights were cancelled in the park, making the park fully protected from development. Conservation Minister Stan Struthers announced the addition of a new Ecological Reserve, the extension of interim protection for a park reserve, and an addition to an existing provincial park, as part of the provincial Protected Areas Initiative (PAI) November 29, 2004 The announcement will result in the addition of 22 hectares of protected lands to Manitoba's network of protected areas and continues interim protection for 100,300 hectares of land. The 7 hectare Jennifer and Tom Shay Ecological Reserve is Manitoba's eighteenth ecological reserve and features a rare river-bottom forest along the eastern bank of the Red River. Protection of this site, which was flooded in the 1997 Flood of the Century, also honours the lifelong contributions of the Dr. Jennifer and Dr. Tom Shay in protecting Manitoba's ecological systems and heritage. The minister also announced the extension of the 100,300 hectare Chitek Lake Park Reserve to 2009. The extension was requested by the Skownan First Nation to allow for more time for community review of the proposal to establish a permanent park in the area. 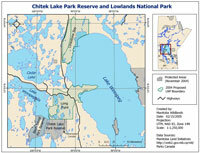 The Chitek Lake park reserve overlaps with the 2004 proposed boundaries for the Lowlands national park. Finally, Minister Struthers announced the signing of a lease-exchange agreement to add land owned by Marcel Taillieu to Beaudry Provincial Park. The Taillieu property covers 15 hectares of river-bottom forest along the north bank of the Assiniboine River bordering Beaudry Provincial Park. The Taillieau property supports a variety of terrace, floodplain and channel-shelf forests. These forests are dominated by bur oak, green ash, Manitoba maple and the spectacular large basswoods and cottonwoods. Chitek Lake Park Reserve continues to be protected from development for an additional five years. The Park Reserve regulation was amended by the Government of Manitoba on September 30, 2004 to extend interim protection for these lands within the traditional territory of Skownan First Nation until September 30, 2009. 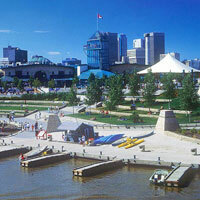 The announcement was made in a November 29, 2004 Government of Manitoba press release and allows more time for community review of the proposal to establish a permanent park in the area. Chitek Lake Park Reserve came from a protected lands nomination by Skownan First Nation; the Park Reserve was established in March of 1999, through the provisions of Manitoba's First Nations Protected Areas MOU. The lands nominated were more than twice the size of the current park reserve. Manitoba's mining sector supports the protection of the full land quantum nominated for protection by the community. 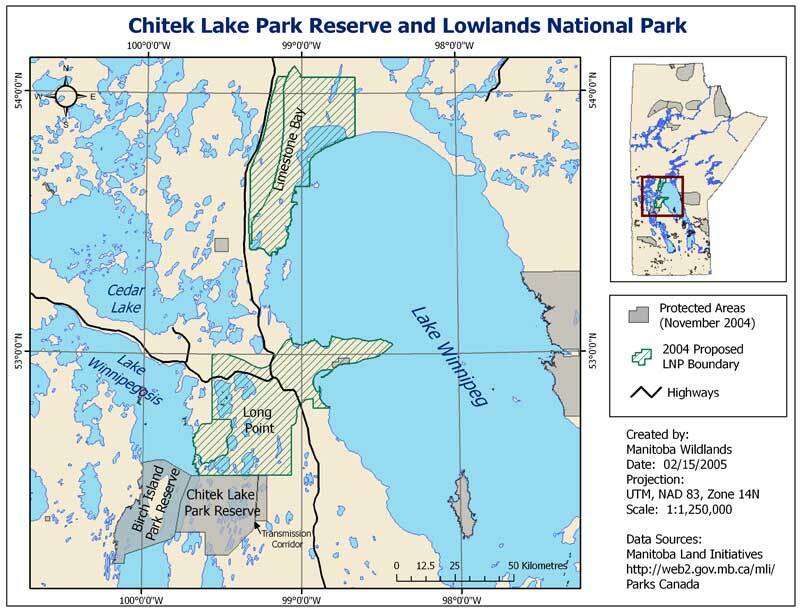 The 100,300 hectare Chitek Lake Park Reserve is located in the central Interlake region along the eastern shore of Lake Winnipegosis, about 350 kilometres northwest of Winnipeg. The area is unique, containing a complex intermingling of glacial till and organic deposits with many different soil types. Chitek Lake forms the primary range of Manitoba's only free-ranging wood bison herd, and is the only location in Manitoba where wood bison, moose, elk, woodland caribou and white-tailed deer share the same area. No roads transect the park reserve, which is surrounded by mixed wood and boreal plains forest. Currently one bi pole-width hydro corridor transects the park reserve, with risk of future hydro corridors crossing the park reserve. Larger Image In spring 2004 Manitoba and Canada entered into an undertaking to have an agreement for establishment of the Lowlands National Park by summer 2005. Significant Skownan First Nation traditional territory and lands the community nominated for protected status are within the geographic scope for the future national park. The Chitek Lake park reserve is south of the Long Point component for the proposed lowlands national park. Manitoba's Premier announced additions to Manitoba's network of protected areas - the 11,310 ha Bell and Steeprock Canyons Protected Area, and the 15 ha Little George Island Ecological Reserve June 14, 2004. He also announced extension of interim protection for the 780,000 ha Poplar/Nanowin Rivers Park Reserve. Rivers Provincial Park now includes 50 ha of mixed grass prairie, 4,100 ha of tall grass prairie lands owned by the Nature Conservancy of Canada and protected through a joint agreement were also announced. All of these sites have also had crown (provincial) mineral rights withdrawn. The Bell and Steeprock Canyons Protected Area is located within the Porcupine Provincial Forest, approximately 75 km north of Swan River, the protected area captures a cross section of the Manitoba Escarpment complex and some spectacular river canyons carved as a result of glacial melt water. Mature spruce and pine trees dominate portions of the protected area, while aspen predominate the steep sandy slopes along the escarpment. Wetland complexes dot the escarpment creating suitable habitat for breeding, molting and staging areas for numerous migratory birds. The Bell and Steeprock Canyons are home to large ungulates such as moose, elk, and white-tailed deer. The area is also home to a large population of black bears. Little George Island Ecological Reserve lies in the north basin of Lake Winnipeg, about 40 km due west of Poplar River First Nation. The island is generally flat with few trees, although extensive areas of willow shrubs and grassland meadows occur. Little George Island is special because it is a prime nesting site for colonial nesting birds, including Caspian and Common Terns and Greater Scaup, a diving duck. Thousands of nests occur on the island each year during breeding season, which begins in June and extends into August. Visitation to the island is discouraged during this sensitive period. The extension of interim protection for the Poplar/Nanwin Rivers Park Reserve until September 30, 2009 was also part of this announcement. First designated and protected as a park reserve in 1999, the park reserve is part of the traditional territory of Poplar River First Nation, and was nominated by the community to be protected from industrial development. The additional period of interim protection was required to complete management planning for the area. The Nature Conservancy of Canada (NCC) owns over 4,000 hectares of endangered tall grass prairie of southeastern Manitoba. Prior to European settlement, the tall grass prairie ecosystem covered much of the Red River Valley in south-central Manitoba. Since then, most of this land has been largely transformed for agricultural purposes and urban development. 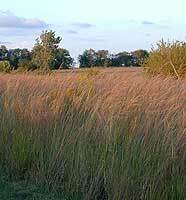 The tall grass prairie is now the rarest and most endangered ecosystems in North America. Through a Memorandum of Agreement between the Government of Manitoba and the NCC, 4,118 hectares in the Rural Municipality of Stuartburn now contribute to Manitoba's network of protected areas. This agreement provides a legal mechanism to ensure that NCC lands meet the provincial government's definition of a protected area in which logging, mining, hydroelectric, oil and gas development, as well as other activities that could significantly and adversely affect natural habitat, are prohibited. 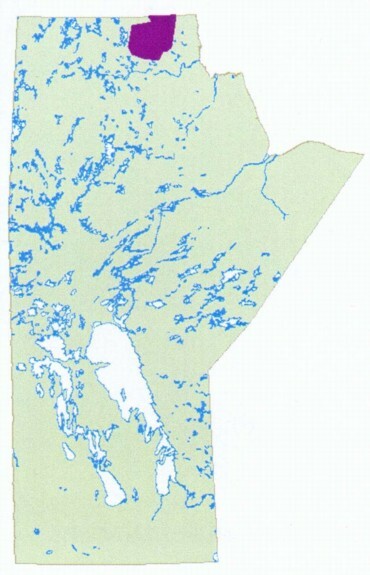 The joining of these NCC owned lands to Manitoba's network of protected areas marks the first time privately owned land has been included in the network. The Premier's announcement was touted as signifying renewed commitment to Manitoba's Protected Areas Initiative (PAI). Premier Doer referred to upcoming establishment of protected areas, including the joint Memorandum of Understanding for establishment of the Lowlands national park by late spring 2005. Currently only one third of Manitoba's network of protected areas is in place across the province's natural regions. The park is composed of a 130 hectare area that preserves and protects the heritage value of the former homestead of the Criddle/Vane family. The park also protects representative features of the Assiniboine Delta Natural Region including mixed-grass prairie while accommodating nature-oriented recreational and educational opportunities and experiences that are respectful of the natural setting and historic environment. The Criddle and Vane families are Manitoba pioneers well-known for their contributions in the fields of science, art, sports, and culture, as well as for their somewhat eccentric lifestyle. They settled in Manitoba in 1882, and the last family members left the homestead in 1960. Their homestead (NE 32-8-16W and SE 5-9-16W) was acquired by the Province of Manitoba in the 1970's. The site includes the Criddle home, the remaining structure of the first entomological field station in western Canada, a cemetery, old foundations, and the remains of original landscape features such as the family tennis courts and a golf course. The Manitoba Government announced the extension of interim protection for two park reserves, and permanent protection for a third park reserve in an April 29, 2003 announcement held on the Legislature grounds. Conservation Minister, Steve Ashton announced that the province has created the Criddle / Vane Homestead Park Reserve. The site is the former homestead of the Criddle and Vane families; Manitoba pioneers well known for their contributions in the fields of science, art, sports and culture. The site is also significant to insect researchers for long-term scientific study. The park reserve is located in southwestern Manitoba about 40 kilometres southeast of Brandon. 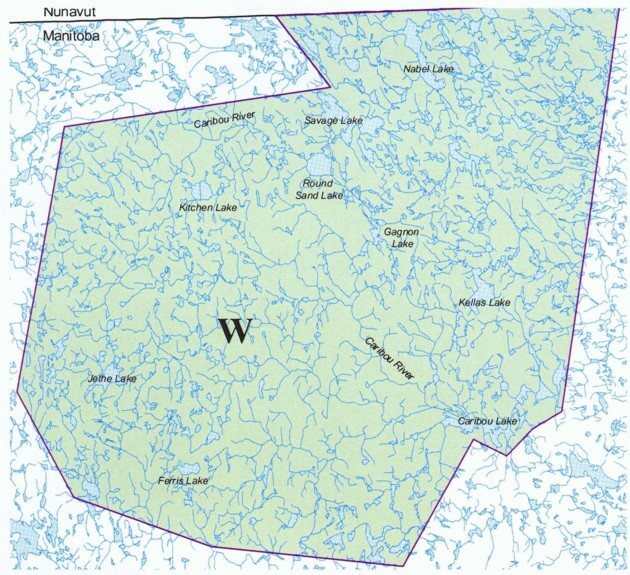 Extension of interim protection for Amisk Park Reserve, a 198,000-hectare protected area originally designated as a park in 1995, and re-designated as a park reserve in 1997 at the request of Nisichawayasikh Cree Nation, in whose traditional territory the park reserve lies, was also part of the announcement. 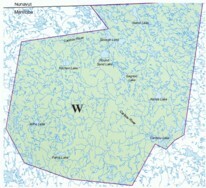 Amisk is located in the high boreal, north and west of Lake Winnipeg. It was supported for protected status each time the park reserve decision was renewed. Permanent designation for South Atikaki Park was also part of the provincial announcement. Located south of Wallace Lake in eastern Manitoba, South Atikaki Provincial Park offers numerous eco-tourism attractions including canoeing, hiking and camping in pristine wilderness. The 14,000 hectare park is an addition to Atikaki Wilderness Park. 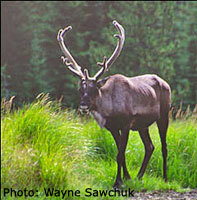 South Atikaki is also important because it includes habitat for Manitoba's threatened Woodland caribou. As of February 2005, the park is protected from logging, but regulation has not been put in place to protect lands from mining supported by the mining sector for protected status. Our readers should note that the Manitoba government press release mistakenly refers to South Atikaki Park as a protected area. Premier Gary Doer announced regulatory steps regarding Parks in Manitoba at a September 26, 2002 ceremony held at the Trappist Monastery in St. Norbert, a community within southern greater Winnipeg. The Trappist Monastery, now permanently designated as a heritage park, has been a community and cultural gathering place for many years. 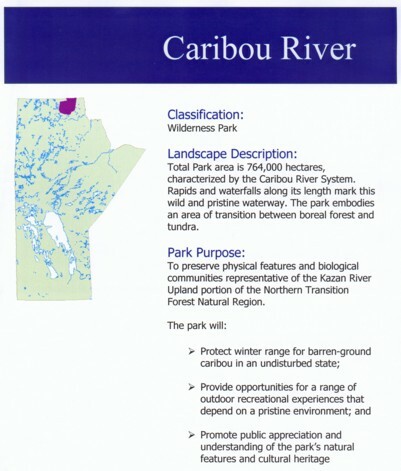 Permanent protection of Caribou River Park, as of May 2002, was announced. Arrived at with the consent of the Sayisi Dene community of Tadoule Lake, the permanent protected status for Caribou River Park was included in the 2002 Canadian Nature Federation protected areas grade for Manitoba. (See earlier News items.) The lands in this former park reserve have been protected by regulation, since 1995. The Premier also indicated the Manigotogan park reserve designation would be extended, so as to complete consultations and work towards tripling the river corridor. Premier Doer told those attending that "we are committed to protecting this spectacular river." The Manigotogan park reserve is currently not protected land, is classified to allow development. The East Paint Lake park reserve, under interim protection status since 1997, was also extended. This allows for completion of technical work. Two park reserves will be the subject of upcoming announcements - Amisk park reserve, protected from development since 1995, and South Atikaki park reserve, non classified land. Premier Doer reconfirmed Manitoba's intention to establish the Manitoba Lowlands national park. Under study since the 1970's, with a federal-provincial MOU to establish the park in place for ten years, and joint government boundaries in place since 1996, the Manitoba Lowlands is one of Canada's most wanted national parks. Prime Minister Chretien has made recent commitments for speedy action on outstanding national parks, including Manitoba Lowlands. Premier Doer's statement that "turning Manitoba Lowlands into a national park is a priority and we will continue to work with Ottawa to complete this process" should lead to early interim protection on the components of the national park at Limestone Bay and Long Point. 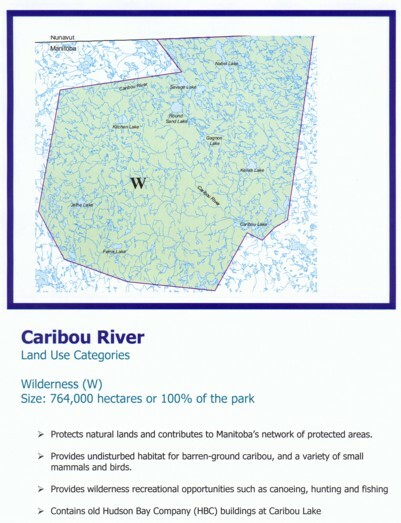 No mention of Manitoba's Action Plan for a Network of Protected Areas, or specifics as to protection standards for wilderness or back country zones in Manitoba's parks was contained in the announcement or press release. View the government of Manitoba press release. 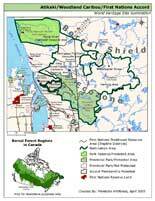 Manitoba protected areas before 2002 are included in the Protected Areas Grade and Audit page.